Brenna is a ski pro at Snow Crystal Resort, but she is more than an employee to the O’Neils. They consider her a member of the family, and Brenna returns their affection. Given her difficult relationship with her own family, she is particularly thankful for the O’Neils. She thinks of Jackson and Sean as brothers, but there is nothing brotherly about her feelings for Tyler. They grew up together, sharing a passion for skiing and a daring to challenge the toughest slopes from the time they were kids, but by the time they were teens, Tyler was playing the lead role in all Brenna’s fantasies. Sometimes it seems to Brenna that she has been in love with Tyler forever, but she has accepted the tough truth that Tyler is unlikely to return her feelings. Jess is not the only one who thinks her dad and Brenna belong together. All the women of the O’Neil family agree with Jess. Kayla and Élise encourage Brenna to be bold, and they are not above manipulating to see that the two are forced to spend more time together. But even if Brenna pushes Tyler to see her as a woman rather than just as his skiing buddy and best friend, there are no guarantees for forever, and forever with Tyler is what Brenna wants. Maybe This Christmas concludes Morgan’s O’Neil Brothers trilogy, and like the earlier books, it is a story that combines a sweet and sizzling romance with family dynamics in a winning mix. Morgan has a gift for creating characters who move from the page into the reader’s heart. Although I read romance because I want to watch lovers earn their happily-ever-after, I am jerked out of the story when protagonists seem to be able to ignore their jobs, their friends, and their families to focus on the pursuit of true love. Morgan never makes this mistake. Tyler and Brenna have work that must be done, family responsibilities that must be met, and friendships that deserve time and attention. Tyler’s relationship with Jess is almost as important to the story as his relationship with Brenna. Jess and Brenna also have a relationship that develops into a closer tie as the story progresses, and Brenna’s troubled relationship with her parents also merits pages. These are fully dimensional characters. Fans of the first two books will be happy to know that Jackson and Kayla (Sleigh Bells in the Snow) and Sean and Élise (Suddenly Last Summer) are secondary characters, as are the O’Neil grandparents and their mother. And since they are all naturally together because they are part of Snow Crystal, their appearances never seem forced. Friends-to-lovers is one of my favorite tropes, and I have rarely seen it employed more effectively than in this book. Tyler and Brenna have a long history together, and Morgan shows her readers the closeness that has evolved through years of friendship. These two understand one another’s strengths and flaws and vulnerabilities. Yet even with that depth of knowledge, they still have things to learn about one another. Morgan skillfully balances these qualities. Some readers may find the shift from sexual tension to consummation unduly long, but I thought it worked for these particular characters. In fact, the only thing about this book that didn’t work for me was Jess’s mother who seemed glaringly one-dimensional in contrast to the other characters. 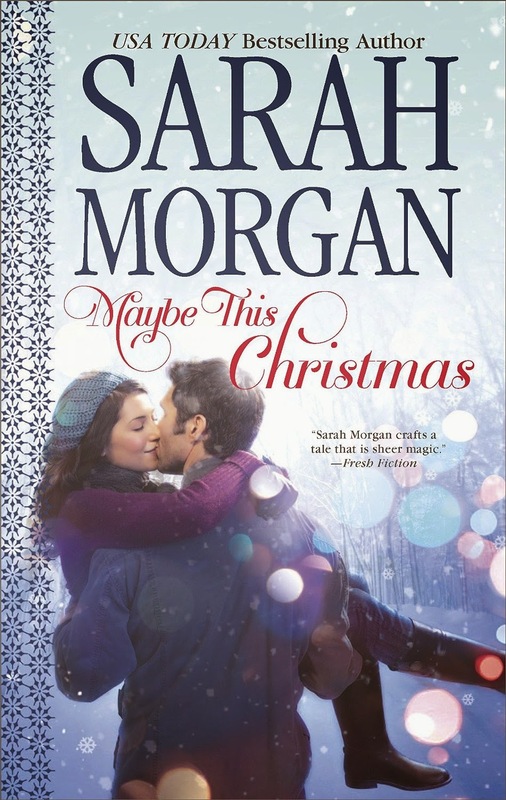 If you like contemporary romance and haven’t discovered Sarah Morgan, you owe it to yourself to remedy the situation immediately. She is among the best in the field. Maybe This Christmas can be read as a standalone, but I highly recommend the trilogy. On the strength of it, I’ve added this author to my autobuy list. I just bought this book, and it is on the top of my TBR pile. I love this series! I really enjoyed this one. I liked the way that the trilogy was rounded off. I also thought that Sarah Morgan did a good job of consistency between the three novels, so that we really felt that we knew Tyler by the time his book came round. Great review. This is next on my wish list. I have loved this series. Great review! Love reading Christmas books. Sleigh Bells in the Snow was one of my favorite books last year! Also, friends to lovers is my favorite trope. So you know I will be reading this book shortly! Thanks for the review! Thanks, Janga. I think I would enjoy this series. I don't think taking a long time for the relationship to develop will be a problem. I have found too many books progress unrealistically (for me) fast. Boy meets girl and they hop in bed together by page 20 is just not realistic or enjoyable. They don't really have a developed relationship. I will be looking for her books and give them a try. Sarah's books are always in my TBR! I can't wait to start reading this because it's my favorite type of storyline! Thanks for the review, Janga!